There are some people who enjoy Dessen, who will happily read her books, and who will gladly recommend those books to others. I am not one of those people. I adore Dessen. I will eagerly devour anything she writes, even if it's a post-it note reminding herself to do the dishes. I shove her books into people's hands and demand they read it now without even bothering to read the summary on the back. That being said, The Moon and More was not my favorite book ever written by her. This does not mean it was not as good as her other books, because that's not true. Her latest novel has everything readers know and love about Dessen: an authentic summer atmosphere, meaningful narration, and characters grappling toward self-discovery and change. It's the same high-quality work that Sarah always provides, it just didn't particularly work as well for me as some of her other novels. For one, I don't think I felt as emotionally connected as I would have liked. I liked Emaline; she was smart, stubborn, and, when she wanted to be, fierce. But I didn't feel like I struggled enough with her. So she and her boyfriend of three years broke up, and while I am glad that she didn't spend much time crying or moping, I didn't necessarily feel the appropriate amount of grief or maybe even regret. (No, there is not a love triangle no matter what the synopsis indicates.) Then her scumbag of a dad comes back into the picture and things get awkward but not dramatic enough. I wanted her blowing up and telling him what a crap basket he'd been as a father. But no, a few tense conversations that mostly felt unresolved to me. My biggest issue: Theo. A nerdy, optimistic, easily excited New Yorker, Theo sounds pretty cute, right? Well at first, I was like, "Hey, I could get behind this guy. He's not too bad." As the book progressed, though, he felt young, certainly not 3 years older than Emaline. Further into the book and he just seemed like an arrogant, close-minded snob. It was obvious that he was all wrong for Emaline, which was kind of the purpose. He was just a summer fling that she wasn't too serious about, even though she spent a large portion of her time with him. When both the readers and the narrator know that it is not a match made in heaven, though, it's hard to really hope for anything or to imagine all the possibilities. Though, of course, things do not stay this way, as Dessen wraps the book up amazingly and presents all the possibilities in the world. While these may seem like hefty complaints, the good qualities certainly outweighed them. There was still a great story unfolding and the beautifully harsh realizations that come with growing up. I loved the family dynamic in this book. Despite the fights and frustrations, they're family. They are there for each other and they love each other. I love me a book with good family values, and this book touches on that quite a bit. Also, I found the secondary characters immensely fascinating in their own ways and I would have loved a bunch more of all (well--most) of them. Benji, Morris, Daisy, Luke, her dad, Ivy. I wouldn't mind if she wrote books for each of them. And, duh, Clyde, who I was delighted had a pretty major part in this book. I was pleasantly surprised how much we learn about Colby in this book, seeing as Colby is pretty much the epitome of summer and a town that continuously enchants me. Readers get to see a bunch of new facets in Colby (and its residents) that make it so much more real than it was before. If you haven't hopped on the Dessen train yet, this isn't the book I'd recommend you buy your first ticket for (others may disagree). However, if you are a raging Sarah Dessen fan like myself, you need this in your hands now. 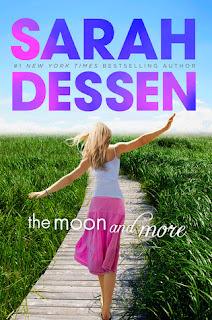 It certainly has the Dessen charm and I was not disappointed by The Moon and More experience. I think I might be the only person in the entire world who hasn't yet ready of Dessen's novels. Nor Jodi Picoult. Nor Jennifer Echols.. Who all seem to be the divas of contemporary fiction/romances. And did I mention I LOVE contemporary fic? How weird is that?! I just don't know where to start with these authors. They all wrote so many amazing stories already, I feel overwhelmed thinking about picking out one of their books to start with. The Moon and More sounds like a great summer read, I'm not sure how I feel about summer flings that are doomed to die a natural death, but I like light reads, and from what I heard Dessen knows how to incorporate more serious issues into her love stories.